Alzheimer’s disease, according to the Alzheimer’s Association, is a form of dementiathat leads to memory, thinking and behavior issues and the Alzheimer’s Association said it accounts for 60 to 80 percent of cases. Unfortunately there is no cure for this illness, but scientists are continuously working on viable treatment options. 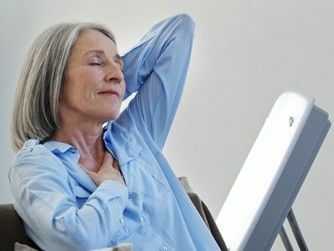 A study recently published in the journal Sleep found that light treatment that focuses on increasing circadian stimulation throughout the day may work to improve depression, agitation and sleep in Alzheimer’s patients. Fourteen patients with Alzheimer’s disease from assisted living were included in the trial, and a light source producing low levels of a blue-white light at 300 to 400 lux with a color temperature of more than 9,000 kelvins was installed in each participant room. During daytime hours, light exposure took place for a period of time over four weeks. Researchers collected light-dark and activity-rest patterns using a calibrated instrument before and after the light treatment. Sleep quality, agitation and depression were also measured by collecting information given using standardized questionnaires. The results showed that being exposed to personalized light treatment during daylight hours for a month considerable improved total sleep duration, efficiency and sleep quality while also seriously lowering depression and agitation scores. Additionally, improvements in sleep quality were linked to noticeable behavioral changes. “Subjective reports by the nursing staff were that the patients were calmer, eating better and their overall behavior was more manageable,” Figueiro told HealthDay. According to the Alzheimer’s Association, more than 5 million Americans are currently living with this cognitive illness, and its the sixth leading cause of death in the U.S. By 2024, the number of people age 65 and older with Alzheimer’s is expected to reach 7.1 million, and by 2050 it’s expected to triple to 13.8 million. Because there is no current cure for this illness, it’s challenging for doctors and scientists to change these numbers, but steps like light treatment may slow the progression of the disease or make it easier to live with.